Summer has been here for a while and the raspberries are ripe and ready! Turning the berries into jam is an easy, almost magical process that brings back the flavors of summer deep into winter. 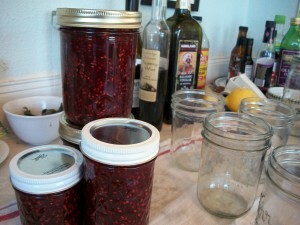 Of all the jams I make raspberry is by far the one that people like the most. This is great as it’s also the easiest to prepare and I’ve never had it not turn out tasting delicious. Step 1: Find berries to pick in your backyard or at a nearby U-pick. When picking the berries look for ones at their peak of ripeness that easily come off the bush. 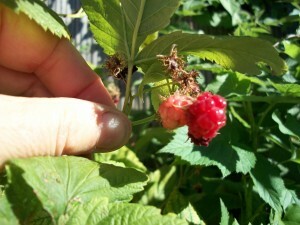 If they are too ripe they will give an off-flavor to the jam and if they are under-ripe they will lack flavor. Step 2: Mash the berries and scoop them into a cooking pot. 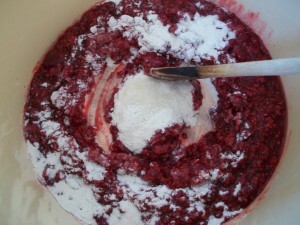 To make firm jam I usually add in pectin. Pectin is a white powder, usually derived from citrus fruits, that helps the jam gel. Some fruits, like apples, are naturally high in pectin so it does not need to be added but for most berries, I do like to use it. Step 3: Add in pectin, bring to a boil then add sugar and cook a bit longer. 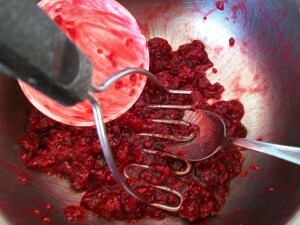 When making the jam, be sure to stir it continuously. If you don’t, it will scorch and all your hard work will be for nothing. I once spent hours pitting cherries then slowly cooking them to make a conserve. The phone rang and in seconds I had a big mess of burned cherries that couldn’t be saved. I nearly cried as I took the pot out to dump on the compost heap. Step 4: Ladle into jars, cap and you’re all set. It’s important to sterilize your canning jars or you will pry the lid up and be greeted with a layer of mold. To sterilize them place the jars in a canning rack then lower the rack into hot water and boil for 10 minutes. If you don’t have a canning rack you can submerge them in a big pot of water but sometimes the jars will break. The final step, of course, is: Enjoy!